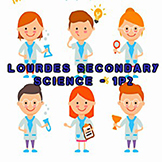 The premier S1 Science class at Lourdes Secondary—all about fun, facts, and the pursuit of science. From discussions to dissections, we are learning how science makes the world go round. Multiple sclerosis is a disorder of the immune system that is caused by a malfunction of our body defenses. In multiple sclerosis, healthy cells of the nervous system are destroyed, and this leads to many health problems, like paralysis. Multiple sclerosis affects a lot of people worldwide. Treatments exist but are still not entirely efficient and do not work for all patients. Many researchers are studying this disease and our group is focusing on specific cells of the immune system that might be playing a role in multiple sclerosis. Multiple sclerosis (MS) is a disease affecting more than 2.3 million people worldwide. It affects mostly women and usually starts between 20 and 40 years of age. MS is present in all countries, but the poorest countries often have difficulties diagnosing it, due to insufficient medical facilities and staff. What does MS look like? Symptoms can include weakness, dizziness, fatigue, vision problems, bladder, or bowel problems, cognitive changes (such as depression or emotional changes), or numbness, paralysis or pain in various parts of the body. MS is a complex disease with several different steps. MS begins with a particular health problem, such as pain or paralysis in a certain part of the body. Doctors call this the clinically isolated syndrome. Then, there is usually a remission period that can last for months or years, in which the patient gets back to apparently perfect health without any more problems. But then comes a relapse, when the patient once again experiences some sort of health disturbance. This disturbance can be the same as or different from the previous one. At this point, doctors perform a specific kind of examination, to see what is happening inside the patient’s brain and spinal cord. If this relapse occurs with visible brain or spinal cord lesions (damaged areas), the doctors can then diagnose the patient with MS, and treatment can then start. Why are the Symptoms So Wild? How can a single disease affect different parts of the body? This can happen because MS actually affects neurons. Neurons are the cells in the brain and spinal cord that control the entire body. So, if a certain neuron is affected by the disease, the symptoms will occur in the body part the neuron is controlling. If the affected neuron controls the left hand, the patient may feel numbness, paralysis, or pain in that hand. If the affected neuron controls the bladder, the patient may experience issues with bladder control. The symptoms can be experienced over the entire body, but the cause is actually multiple lesions in the brain and spinal cord. MS lesions are always located in the brain and spinal cord, which is why doctors need to know what is happening in these areas in order to diagnose MS.
Now, let us focus on neurons, the cells that are affected by MS. Neurons are very interesting cells. They are composed of a main part, called the cell body, which is roundish in shape. On the cell body, there is a big extension that connects the neuron to another neuron or another organ. This extension is called an axon. The function of the axon is to send messages from the neuron, for example to command to a muscle to contract. The axon is like an electric cable: to properly function, an insulating covering, or sheath, is required. In the body, this sheath is called myelin (Figure 1). The myelin sheath is essential for most neurons to send messages all across the body. Figure 1 - The neuron (yellow) is composed of a cell body (right side) and an axon (left side). 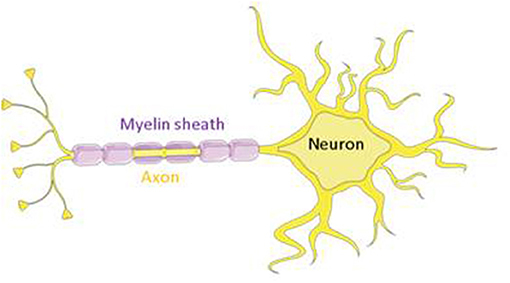 The axon is wrapped in the myelin sheath (purple). What happens to this myelin sheath during MS? It is destroyed! The destruction of the myelin sheath interferes with the transmission of messages from the neuron. 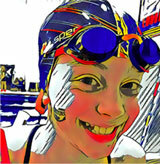 For example, a neuron might no longer be able to tell the legs muscles when to contract and when to loosen. So, even though the legs themselves are fine, some patients might experience problems walking (Figure 2). This is very similar to what happens when the sheath of an electric cable is damaged. The electricity cannot go through the cable anymore and the appliance requiring the electricity cannot function. Figure 2 - Neurons located in the brain and spinal cord send commands to the body through the axons of neurons. For example, the command to walk is sent from the brain to the leg muscles. But why is the myelin sheath damaged in MS? Because the immune system attacks and destroys it. To better understand how MS occurs, we need to know how the immune system works. The immune system is composed of cells located mainly in the blood, under healthy conditions. These immune cells travel all over the body through the blood, to help us stay healthy. When an organ is infected, for example the nose when we have a cold, the immune cells enter it to cure it. The cells of the immune system are capable of detecting external invaders, such as viruses and bacteria, and they are also able to detect internal problems, such as cancer cells. Once detected, the immune cells attack the problem cells and fight to destroy them. The immune cells then help to repair the damaged organ. There are different types of immune cells (Figure 3). Some immune cells are present in the body even before birth, ready and waiting to defend us. These cells are part of what is called the innate immune system, and they are specialized for detecting viruses, bacteria, and any other diseased cell. The cells of the innate immune system can quickly alert the entire immune system of the presence of unwanted visitors. However, these cells are not enough to stop the progression of the disease. They watch for problems, alert the rest of the immune system, and only fight weakly as a first line of defense. On the other hand, some immune cells are not as good at detecting problems. They often need the innate immune cells to point them in the right direction. These cells are called adaptive immune cells, because they can adapt to what the innate immune cells are telling them. Their role is to fight and destroy anything that can cause a disease. Figure 3 - Innate immune cells (green) are more involved in surveillance functions. Adaptive immune cells (blue) are more involved in fighting infected or cancerous cells. What Do Immune Cells Do During Multiple Sclerosis? In MS, the immune system destroys the myelin sheath around neuronal cells. We still do not understand exactly how. Researchers first thought that MS was caused by adaptive immune cells, called T cells and B cells. In MS, T and B cells leave the blood to enter the brain and spinal cord. Once there, they attack and destroy the myelin sheath. Researchers developed drugs to block B and T cells from leaving the blood and attacking the myelin sheath. These drugs helped to decrease the symptoms of MS, but they were not enough to completely stop MS and cure the patients. MS can still occur even when T and B cells are blocked with drugs, which means that other cells are involved in the disease. It was recently shown that innate immune cells, the ones mainly involved with detecting problems, are also involved in MS. There are several types of innate immune cells that might be involved, called macrophages, microglia, dendritic cells, monocytes, and neutrophils. Monocytes and neutrophils enter the spinal cord before the adaptive T and B cells do . Once in the spinal cord, the innate immune cells are probably calling the adaptive immune cells to join them. We think that innate immune cells are directing the adaptive immune cells to attack the myelin sheath (Figure 4). However, the exact relationship between adaptive and innate immune cells in MS is still unclear. For example, it is unknown how innate immune cells call adaptive immune cells to enter the brain and spinal cord. Figure 4 - In multiple sclerosis, innate immune cells first enter the spinal cord and reach the axons. Then, adaptive immune cells arrive and destroy the myelin sheath. The neuron is thus unable to send commands to the body. 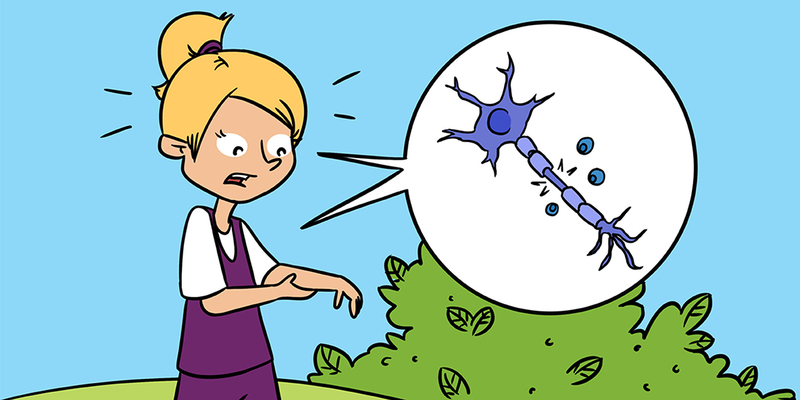 Also, even though the innate immune cells are not great fighters, they can still damage the myelin sheath themselves. We have found that, in MS, there are more innate immune cells in the spinal cord than adaptive immune cells, leading us to believe that innate immune cells are important in the progression of MS.
We discovered that innate immune cells are very important in multiple sclerosis. They are numerous and appear in the spinal cord before the adaptive immune cells! Treatments for MS today are mainly focused on blocking adaptive immune cells, because these cells were discovered to be involved in MS first, before we realized the importance of innate immune cells. Now that we know that innate immune cells are involved too, we hope that blocking them will lead to new, more effective drugs for the treatment of MS.
We still do not know why both the innate and adaptive immune systems are attacking the myelin sheath. But many scientific studies are taking place to answer this question. Some factors were discovered that increase the risk of MS, for example smoking, or a lack of vitamin D during childhood. But the connection between these factors and the immune system’s behavior still remains a mystery to us. Many researchers and doctors are working hard to understand what causes MS and how to cure it. CC wrote and submitted the manuscript. Clinically Isolated Syndrome: ↑ The first time multiple sclerosis symptoms appear. Remission: ↑ Disappearance or attenuation of the symptoms of a disease when that disease is still present. Relapse: ↑ Re-appearance or worsening of the symptoms of a disease, after remission. 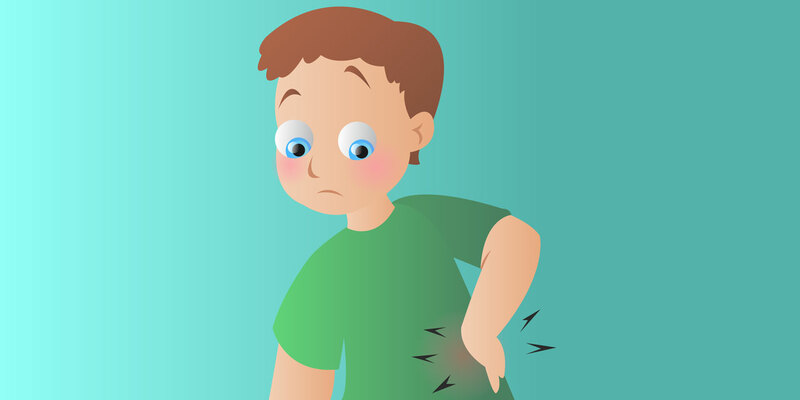 Lesions: ↑ Injuries in the brain or spinal cord that can be seen with special medical equipment. Neurons: ↑ Cells of the brain and spinal cord that control the body. Myelin: ↑ A sheath around neurons’ axons that is necessary to messages to be sent between cells. The myelin sheath works similar to the sheath around an electric cable. Images were created using Servier Medical Art under Creative Commons Attribution 3.0 Unported License. 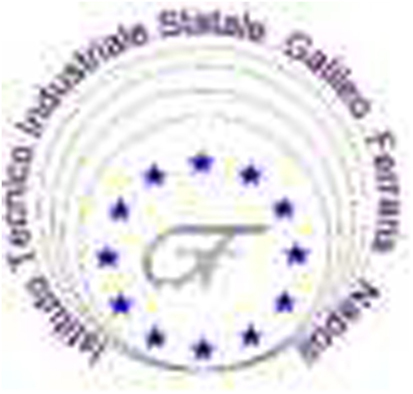 My work was supported by a Marie Skłodowska-Curie Actions fellowship from European Commission program H2020. 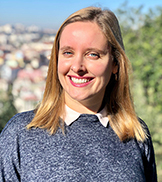 I warmly thank Dr. Aurélie Soubéran for great help writing this article. Submitted: July 23, 2018; Accepted: January 15, 2019; Published online: January 31, 2019. How Does Aspirin Work in Plants and Humans?